There are convincing reasons why starch-free depositing has become the process of choice for producing high quality jellies and gummies. 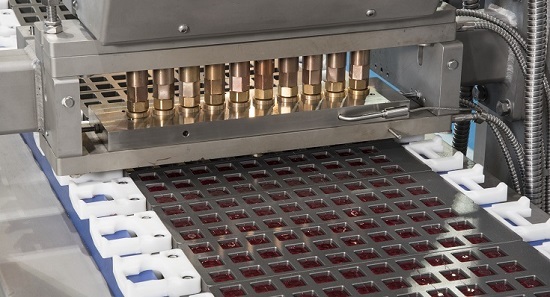 Baker Perkins has long believed that depositing jellies and gummies into solid moulds gives a much higher quality product than depositing into starch trays. It is also hygienic, adheres to the principles of GMP and is readily validated to FDA/EMEA standards. These three factors make starch-free depositing the only viable choice for the expanding functional / nutraceutical jelly and gummy market. The advantages of starch-free depositing are not limited to healthcare products - they apply to the full range of jellies and gummies. 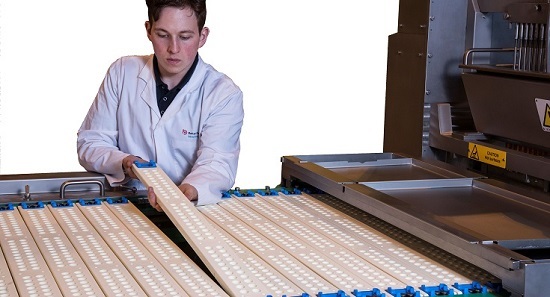 The starch process involves handling and filling starch trays, drying out the products, recycling the starch and keeping the line clean - bringing increased labour, energy, and consumable costs. Starch-free depositing means reduced capital costs and floor space. The process also allows manufacture of confectionery that cannot be made on a starch mogul, such as intricate 3D shapes. After choosing the manufacturing process, the key question is choice of supplier. Here there is one crucial issue: experience. Some mogul manufacturers are now offering starch-free depositors but betray their lack of experience in this field with systems that are simply adaptations of mogul systems - with several significant flaws. 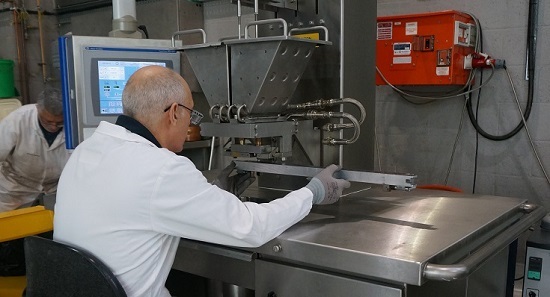 Baker Perkins has been involved with starch-free depositing since very early experimental days in the 1950s. We remain the acknowledged leader because of a policy of continual improvement. Here are four areas where Baker Perkins’ experience and dedicated starch-free technology offer significant advantages over an adapted mogul. 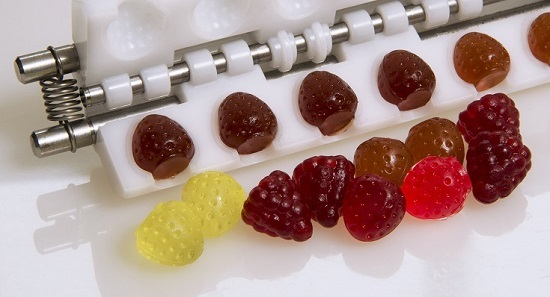 Baker Perkins’ know-how covers the full range of moulds for jellies and gummies – metal, silicone and plastic. The correct choice of mould material is critical to successful ejection and is highly product-specific. It also has a direct bearing on cooling time as products need to be a lot firmer to be ejected from silicone moulds by deformation than from metal moulds by air ejection. Metal moulds impart a better surface finish than silicone, can tolerate more intricate designs and also accelerate the cooling process. Silicone moulds have their place, but only if 100% ejection can be achieved. If it can’t, a different mould material should be chosen rather than designing a system to deal with blocked moulds, as some mogul suppliers do. This eliminates the cost of labour and energy for drying but makes the syrup more viscous. 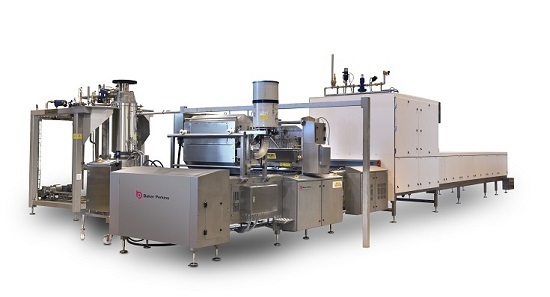 Baker Perkins’ depositors use high-accuracy volumetric pumps that have been optimised for dealing with viscous syrups while maintaining excellent weight control. The syrups used on starch moguls are much less viscous so their depositing systems may not be ideally suited to the application. When depositing viscous syrups it is usually difficult to achieve a clean separation between successive deposits. This is minimised in Baker Perkins’ systems thanks to independent servo control of the depositor head and pump profile, as well as lifting and travelling the moulds. The combined effect is to break the thin strand of syrup between one deposit and the next. Again, a depositor head designed for low viscosity syrups may not have the range of movement necessary to achieve this. Baker Perkins maintains an Innovation Centre equipped with a full range of development-scale confectionery cookers and depositors. Here our process technologists work on internal development projects and with customers to refine and improve products and processes. We also work closely with ingredient suppliers to jointly develop the ingredients and process to optimise quality and efficiency. 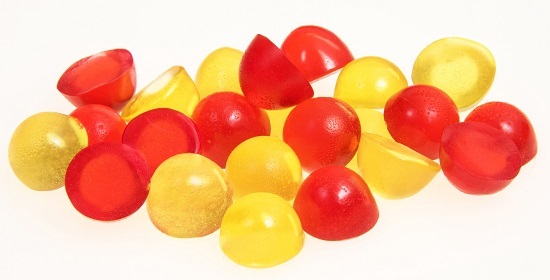 In gummies and jellies we have worked successfully with gelatin supplier Rousselot on reducing setting times for gelatin gummies and carrageenan supplier CEAMSA on achieving gelatin-like textures in a vegetarian product. Starch-free depositing can deliver the highest levels of product quality, hygiene and low cost consistency. We have tried to illustrate why designing a successful starch-free depositor is not quite as simple as fitting solid moulds to a mogul line and would welcome the opportunity to discuss it with you further.